This page will take you through the steps you need to do to use Redux to manage your application’s state. Redux is a small state management container, that is view agnostic and widely used. It is centered around the idea of separating your application logic (the application state) from your view layer, and having the store as a single source of truth for the application state. We recommend reading some of the Redux docs for a good introduction, as well as this awesome cartoon intro to Redux by Lin Clark. One of the neat features of Redux is that it lets you do time travel debugging; in particular, we use this Chrome extension. state: this is the information contained by the app. In general, any element properties that you use could be considered the state. store: the thing that holds the state. You can only have one store, and it is the source of all truth. You can get the state from the store via store.getState(). actions: represent the facts about “what happened” to the state, and are how the application communicates with the store (to tell it that something needs to be updated. You send an action MEOW to the store using store.dispatch(MEOW). action creators: functions that create actions. They return an action, which can then be dispatched. You use an action creator in your app via store.dispatch(doAMeow()). Action creators can also dispatch asynchronous actions, which makes them very useful! reducers: describe how the state updates as a result of an action. They are functions that take the old state, an action, and (after doing some work), return a brand new copy of the state, with the right updates applied. app.js to deal with big picture app-related data, such as online/offline status, route paths, etc. products.js for the list of products you can purchase. 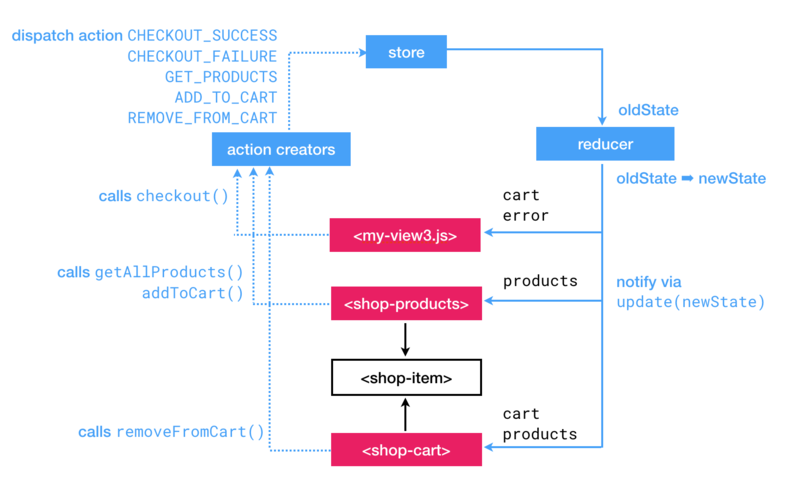 cart.js for the shopping cart. Verb(+noun, optional), present tense: ADD_TODO, FETCH, FETCH_ITEMS, RECEIVE_ITEMS. These should represent what’s about to happen, not what has already happened. Same as action type, camel cased (addTodo -> ADD_TODO). categorySelector/itemsSelector vs getCategory/getItems (to distinguish that one is a selector, whereas the get* methods could just be non-memoized selectors). Generally, anything that needs to have direct access to the store data should be considered a connected element. This includes both updating the state (by calling store.dispatch), or consuming the state (by calling store.subscribe). However, if the element only needs to consume store data, it could receive this data via data bindings from a connected parent element. If you think about a shopping cart example: the cart itself needs to be connected to the store, since “what’s in the cart” is part of the application’s state, but the reusable elements that are rendering each item in the cart don’t need to be connected (since they can just receive their data through a data binding). In this example, only my-app and my-view1 are connected. Since a-element is more of a reusable component rather than an application level component, even if it needs to update the application’s data, it will communicate this via a DOM event, like this. If you want to follow along with actual code, we’ve included a basic Redux counter example in pwa-starter-kit. You can find more details on the lazyReducerEnhancer in the Lazy Loading section. // warning in the console. // Do some sort of work. The goal of this walkthrough is to demonstrate how to get started with Redux, by explaining how we added 2 of the standard Redux examples in the pwa-starter-kit template app. This is a plain element that’s not connected to the Redux store. It has two properties, clicks and value, and 2 buttons that increment or decrement the value (and always increment clicks). Add counter-element to this view. Note that we pass the state down to the element, since the state lives in the Redux store, not in the element. We do this because even though the counter-element updates its internal properties every time you click any of the buttons, that may not necessarily be the true state of the app – imagine a more complex example, where a different view is also updating the value of this counter. The store is then the only source of truth for the data, and the counter-element must always reflect that. Lazily load the reducers. You don’t have to do this (especially if you’re prototyping), but since this view is lazy loaded, its reducers should be as well (to follow the “don’t do anything until you actually need it” PRPL approach). Note that here both _clicks and _value start with an underscore, which means they are protected – we don’t expect anyone from outside the <my-view2> element to want to modify them. increment is an action creator. It is defined in src/actions/counter.js, and dispatches an INCREMENT action (and the same for decrement). When the store receives this action, it needs to update the state. This is done in the src/reducers/counter.js reducer. This is a connected element that displays both the list of products, the cart, and the Checkout button. It is only connected because it needs to display conditional UI, based on whether the cart has any items (i.e. show a Checkout button or not). This could’ve been an unconnected element if the Checkout button belonged to the cart, for example. Pressing the Checkout button calls the checkout action creator. In this action creator you would do any credit cart/server validations, so if the operation cannot be completed, you would fire CHECKOUT_FAILURE here. We simulate that by flipping a coin, and conditionally dispatching the async action. If the checkout action succeeds, then the products object will be updated (with the new stock), and the cart will be reset to its initial value (empty). One thing to note: in the src/reducers/shop.js reducer we use a lot of slice reducers. A slice reducer is responsible for a slice (yes, really) of the whole store (for example, one product item) and updating it. To update the available stock for a specific item ID in the store, we call the products slide reducer (to reduce the whole store to just the products), then the product slice reducer for the product ID passed in the action. This element gets the list of products from the store by dispatching the getAllProducts action creator. When the store is updated (by fetching the products from a service, for example), its stateChanged method is called, which populates a products object. Finally, this object is used to render the list of products. getAllProducts is an action creator that simulates getting the data from a service (it doesn’t, it gets it from a local object, but that’s where you would out that logic). When the data is ready, it dispatches an async GET_PRODUCTS action. Note that whenever a product is added to the cart, the addToCart action creator is dispatched. This updates both the products and cart objects in the Redux store, which will in turn call stateChanged in both shop-products and shop-cart. Similar to shop-products, this element is also connected to the store and observes both the products and cart state. One of the Redux rules is that there should be only one source of truth, and you should not be duplicating data. For this reason, products is the source of truth (that contains all the available items), and cart contains the indexes, and number of, items that have been added to the cart. If you don’t want to connect every element to the store (and you shouldn’t), unconnected elements will have to communicate the need to update the state in the store. Alternatively, you can write a helper to automatically convert any Polymer foo-changed property change event into a Redux action. Note that this requires the <child-element>’s properties to be notifying (i.e. have notify: true), which isn’t necessarily true of all third party elements out there. Here’s an example of that. To make your app more modular, you can split the main state object into parts (“slices”) and have smaller “slice reducers” operate on each part (read more about slice reducers). With the lazyReducerEnhancer, your app can lazily add slice reducers as necessary (e.g. add the counter slice reducer when my-view2.js is imported since only my-view2 operates on that part of the state). // This element is connected to the Redux store. // We are lazy loading its reducer. To see an example of this, check out the cart example’s cart quantity selector or the item selector from the HN sample app. In both examples, the selector is actually defined in a reducer, since it’s being used both on the Redux side, as well as in the view layer. Use one-way data bindings to pass primitives (Strings, Numbers, etc) down to the element. Listen to foo-changed events outside the element, and dispatch an action to update the store from there (example). Listen to change events as above to dispatch an action to update the store. With Redux, you’re basically on your own for routing. However, we have provided a helper router to get you started. Our suggestion is to update the location state based on window.location. That is, whenever a link is clicked (or the user navigates back), an action is dispatched to update the state based on the location. This works well with time-travel debugging - jumping to a previous state doesn’t affect the URL bar or history stack. // will depend on your app. // Do other work, if needed, like closing drawers, etc. One of the main aspects of the PRPL pattern is lazy loading your application’s components as they are needed. If one of these lazy-loaded elements is connected to the store, then your app needs to be able to lazy load that element’s reducers as well. // Not-lazy loaded reducers that are initially loaded. One of the things your app might want to do is save the state of the app in a storage location (like a database, or localStorage. Redux is very useful for this, since you basically just need to install a new reducer to subscribe to the state, that will dump the state into storage. loadState(),  // If there is local storage data, load it. // This subscriber writes to local storage anytime the state updates. That’s it! If you want to see a demo of this in a project, the Flash-Cards app implements this pattern.